Pixel Dust Photo Art: "Came So Far For Beauty"
Leovi from La Fotografia Efectista Abstracta/Abstract Photos has a wonderfully creative tribute to poet, philospher, singer Leonard Cohen at his blog for all 31 days of the month of October. 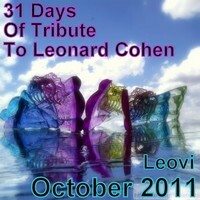 Since I have 'worshipped at the altar' of Leonard Cohen for many years, I just had to participate. Cohen, a native Montrealer, wanders freely throughout this city (when he is here) - especially in his favorites haunts of the city called Outremont and The Plateau. Once when my grandaughter was about five years old, she went out for an early breakfast with her father at a well known cafe in The Plateau, and ended up seated at a counter beside Leonard Cohen. Cohen, who can never resist a beautiful woman, no matter what her age, asked my grandaughter her name. "Indya", said Cohen, "that's a very auspicious name. Now you must work hard to live up to the name you have been given." Indya had no idea who this man was, nor what the word 'auspicious' meant. Apparently she smiled shyly. Cohen patted her on the head, smiled at her father and they all resumed eating their breakfasts. Sweet. 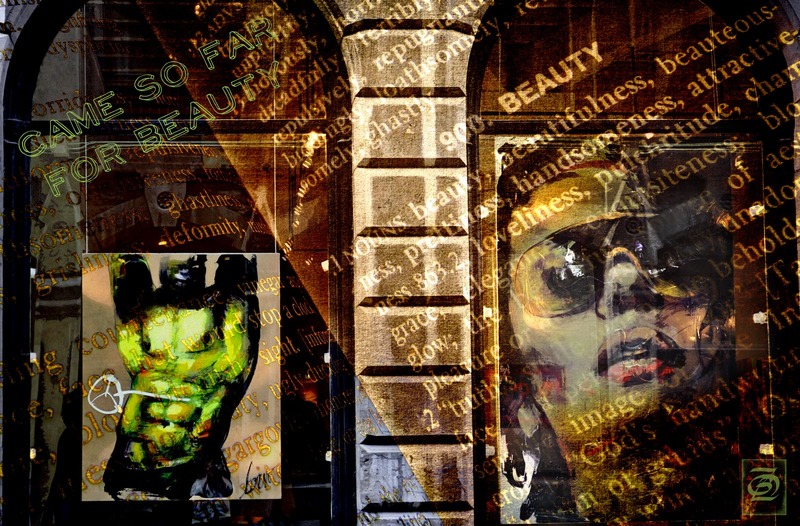 Today I want to honor Cohen with an image dedicated to his song "Came So Far For Beauty". I've always like Jennifer Warnes interpretation of this song. The photograph was pulled from my archives and is of the window of an art gallery displaying paintings that made me think of Cohen's piercing lyrics about the sacrifices we make for beauty. I wonder how many of us have left our "masterpiece unsigned" because of a frantic, futile quest for beauty? A beautiful tribute and I think your photo definitely shows the meaning of the song. Realmente maravillosa, nadie como tú para hacer una interpretación tan buena, me encanta, con una textura de lujo para una deliciosa composición. Muchas gracias por sumarte hoy al homenaje a Leonard Cohen de una forma tan brillante y emotiva. Un abrazo. Lovely story about your granddaughter and Mr. Cohen. Lucky girl. Anything by Leonard Cohen intrigues me, especially this song. I have been following this on Leovi's blog, and it is really so beautiful.